Is Hoop Dreams right for you? If you're the coach of a school or club basketball team and you're looking for an opportunity for your team to compete, improve, and build strong connections early in the season, consider our weekend basketball tournaments. Each team entered is guaranteed at least three games, and competes in a round-robin tournament with a chance to play for the championship. All games are played on the brand new outdoor courts, unless the weather forces the games into our brand new indoor gym. Players get to stay in a cabin that fits 8-14 teammates and a Hoop Dreams team liasons, while coaches get to stay in seperate coaches cabins. All cabins are brand new, and include washrooms and showers, heating and air conditioning, and electricity. 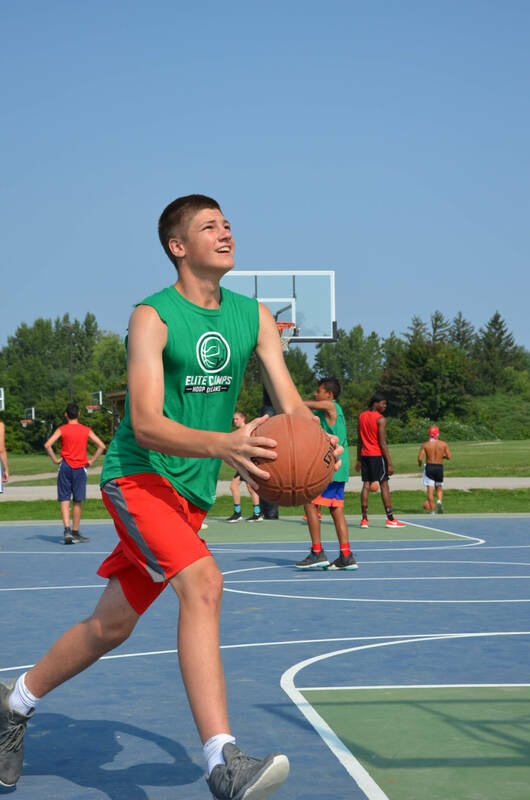 All players and coaches get access to all of the fun activities that the Elite Camps Outdoor Leadership Centre has to offer, including swim, kayak, canoe, sail, stand-up paddleboard, tubing, water-skiing, climbing wall, ropes course, and beach volleyball. Stay tuned for any upcoming dates. The cost per player is $175 plus applicable taxes. Each team can bring two coaches free of cost, and any additional coaches or parents that wish to accompany the team will be charged $165 plus taxes. Our entire facility is available for group rentals, and can host groups of up to 140 people. Please contact us at hoopdreams@elitecamps.com if you are interested in renting our facility. A retreat at the Elite Camps Outdoor Leadership Centre is filled with camp activities and leadership activities that will help your group grow as individuals and as a team. Our staff have backgrounds in high-performance sport, and have the insight to help business, sport, or non-profit teams at any level learn and grow. With access to all of the activities and facilities on our 75-acre site, you can choose what program you want to do, or run your own program. For more information or to book your retreat, please contact our director Kevin Churchill at kevin@elitecamps.com. Our adult basketball retreats are 2 night, 3 day programs for adults that want to improve their basketball skills and experience the joy of camp just like when they were kids. Participants will benefit from the instruction of university and college level players and coaches who will put them through level-appropriate skills and drills. Participants will also participate in 5-on-5 and 3-on-3 tournaments, and improve their knowledge of the game with high-level coaching. Our days start with a full-service breakfast: bacon, eggs, sausages, toast, pancakes, and fruit along with coffee, milk, and juice. Lunches are barbecues - ribs, hot dogs, and hamburgers - with sides and a full salad bar. Dinners change every night, and include an open bar. Please note vegetarian, gluten-free, and special diet options are available at an extra cost. Participants will get to experience all of the non-basketball activities that the Elite Camps Outdoor Leadership Centre has to offer, which include: swim, sailing, canoe, kayak, stand up paddleboard, tubing, water polo, ropes courses, wall climbing, beach volleyball, colour wars, and paint wars. Friday and Saturday nights are time for fun! We bring in amazing DJs, have an open bar, and participants get to enjoy themed parties with all other campers. © 2019 Hoop Dreams. Designed by Gem Webb Internet Marketing and Web Design All Rights Reserved.